Seventeen centuries after the eminent St. Paul travelled across Greece, a solitary man of God traversed the sandy country from border to border, sea to sea, and island to island in a magnificent religious tour de force which stoked the fires of Christianity and the flickering hopes of a people straining under the yoke of Turkish oppression and despairing of a return to their ancient culture after nearly four centuries of brutality. This rare specimen of Hellenic Christianity was named Kosmas, a man whose devotion to God and country brought about a resurgence of the Christian spirit of Greece and anticipated the revolution which was to cleanse this proud country of the oppressors with which it had too long been infested. St. Kosmas was not only a priest but a prophet, scholar, patriot, and miracle-worker as well, and each of these to a degree that merited sainthood. The beginnings of Kosmas were inauspicious enough; he hailed from a village called Mega Dendron, Aitolia, where he was born in 1714, the son of a simple weaver whose wife was extremely devout and who undoubtedly influenced her son in his selection of a religious career. He was baptised Konstas and attended public schools, thereafter to be tutored by a family friend, Archdeacon Ananias. After spending some time as a teacher, Konstas decided to attend a school at the Monastery of Vatopedi on the Holy Mountain of Athos, after which he entered the Monastery of Philotheou where he was tonsured a monk and given the name Kosmas. In rapid succession he became a deacon and then priest. Kosmas had made up his mind to do missionary work, and he could think of no better place to do so than in his homeland, particularly in the remote corners of the rugged peninsula where the lack of churches and flight from persecution had dimmed the light of Christianity. He was determined to revitalise the Christian spirit of every isolated village of Greece and to bring back to the forlorn the age-old Hellenic pride which the Muslims had ground into the dust. 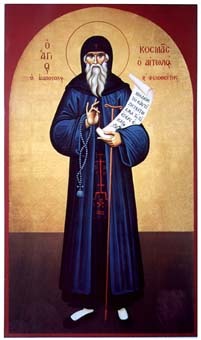 He prevailed upon Patriarch Seraphim II to give him a carte blanche to travel wherever he may be needed for whatever period of time necessary for his mission, and as a preacher at large was given a patriarchal blessing to carry out his noble purpose without interference and with complete independence of action. In some of the more remote villages, where no priest had been seen for years, Kosmas found adults who had not been baptised, a situation which he remedied and which gave him added impetus in his crusade. When word of his valiant missionary zeal reached his old monastery, one of his fellow monks saw fit to make public Kosmas' prophetic powers. Some of his prophecies the people of the time could not comprehend, for Kosmas is not only on record as having predicted that people would be able to converse with each other even though they were miles apart (the telephone), but he also foresaw in the eighteenth century that man would devise a means of flying, and while in flight, unleashing a powerfully destructive force. Over a period of twenty-five years of undiminished zeal, Kosmas travelled not only throughout Greece and its beautiful islands, but he even journeyed through neighbouring Albania. St. Kosmas had trod on Muslim toes, and in the area of Ioannina he was arrested on spurious charges of conspiracy, found guilty, and hanged on 24 August 1779. On 21 April 1961 he was canonised a Saint by the Church -- although he had been revered as one since his death in ceremonies presided over by the late Patriarch Athenagoras who had always admired the gallant Kosmas.